Storytelling is different from Teaching a story. We just describe and explain the characters, situations, and events of the story in the teaching a story. Whereas we use storytelling as a strategy for learning as an input for learners. And it enables them, through experience, learn/acquire the language naturally. Stories keep children engaged and let them feel that they are also participating in the process of storytelling. 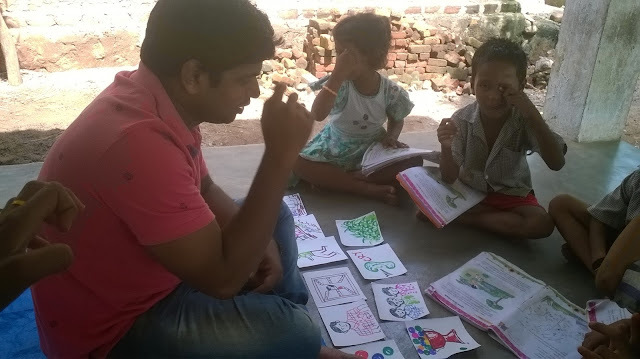 If storytelling is made into an interesting experience and fun-filled activity where the listeners also participate in telling, guessing and manipulating. Here I am going to describe a strategy for storytelling for an interesting transaction. Every story has three major parts, "beginning, middle and ending." The middle part is the peak and turning point a story. So the middle part has a problem or suspense. So in the storytelling, we need to start from the particular point for better and interesting langue learning and understanding. Suppose in the below story I used story cards to explain the story for my 1st-grade children. 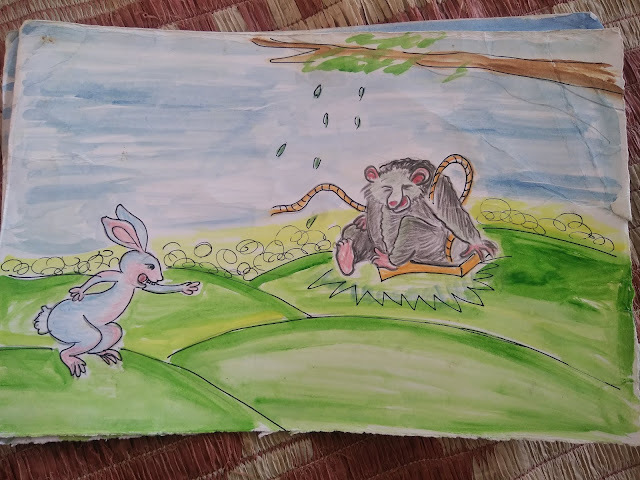 "One day a rabbit was swinging in the forest. 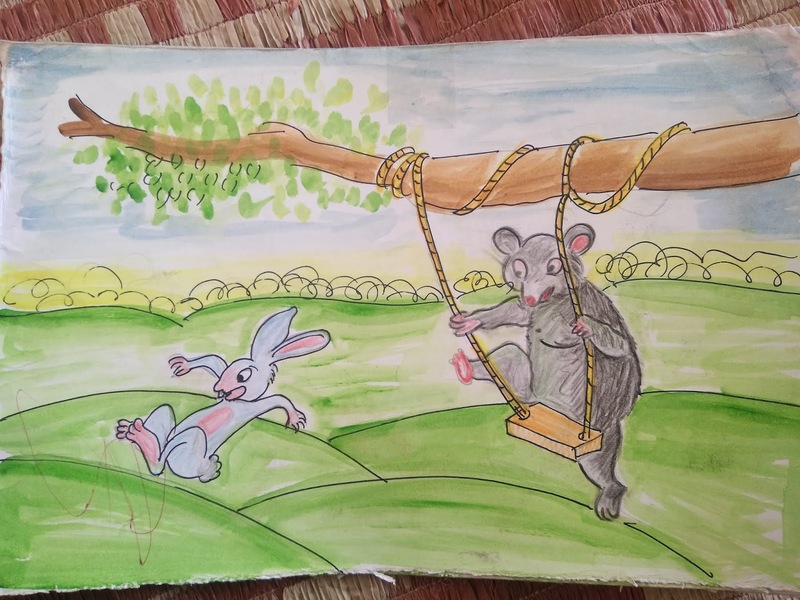 Suddenly a bear came there and pushed the rabbit from the swing. the rabbit complained to the rats, crying for help. The bear started enjoying the swing. 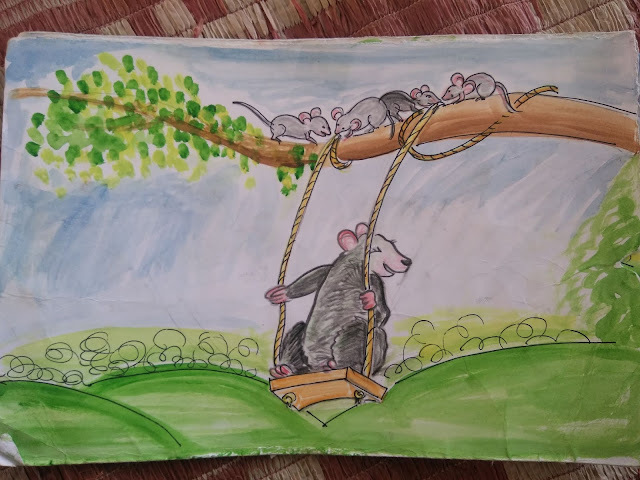 The rats climbed on to the tree and bit the ropes of the swing. 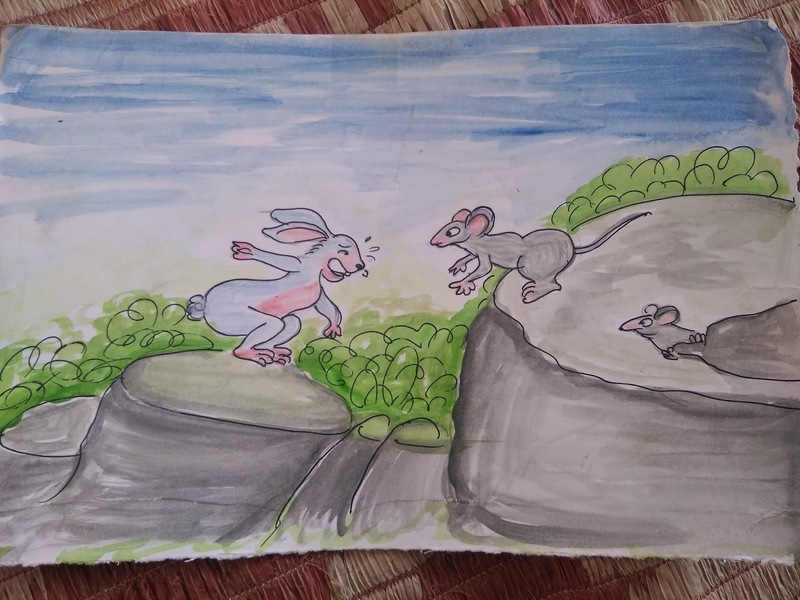 The bear fell to the ground, and the rabbit laughed aloud." I started the story by showing the below card and asked them to respond. Because of this is the turning part of the story. So It gives scope to respond, think and guessing the story in a diverse way. Then I asked a few questions. What was happing in the picture? What was the rabbit doing? What might be the conversation? Was the rabbit complaining or arguing with the rats? After this interaction my students finally said, the rabbit was complaining and seeking help. Then I asked what was the help or compliant? They gave different answers. Then I placed another story card to guess the help or complaint. After that, I placed the below card and asked them to observe. Then I asked some questions to guess the story. What are the rats doing? Why were they bitting the ropes? What might be the next? What happened to the rabbit before this? After this interaction, they guessed half of the story. Finally, I placed rest of two cards to guess the entire story. I placed those cards, not in the correct order and asked my students to say the correct order of the cards. They guessed easily. Then I asked them to say the story and chose a good title as per their understanding. 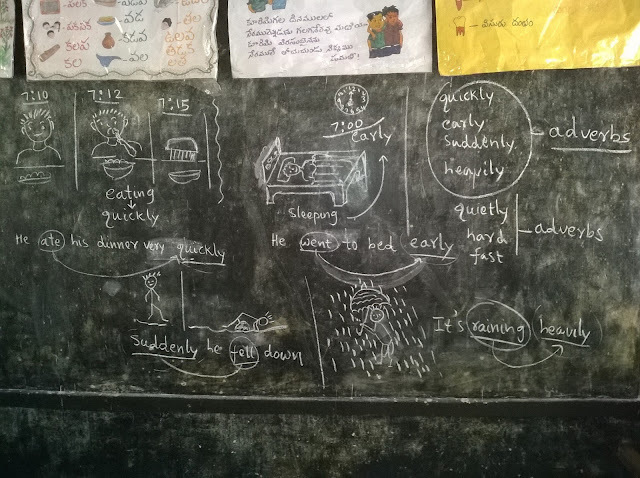 Finally, I explained the story and they enjoyed a lot.